Alice In Wonderland is Central Park's most loved sculpture. It is located on the East side of the park, near 74th Street, north of the Conservatory Water. The eleven foot tall sculpture depicts the favorite characters from Lewis Carroll's book "Alice's Adventures in Wonderland." Philanthropist George Delacorte commissioned the sculpture from José de Creeft in 1959, to honor his wife Margarita. The design is patterned on the illustrations drawn by John Tenniel for the first edition of the book. Children are permitted, and in fact encouraged, to climb on the sculpture, and as you can see in this photo there was a little girl in a pink hat and another with a pink skirt, who were having fun climbing over Alice's magic mushrooms. The sculpture is so popular that it usually looks like this on weekends when there are many children in the park. They flock to the sculpture and climb all over it, as their watchful parents surround them. Here we see The March Hare checking his pocket watch. Alice and her cat Dinah. Engraved bronze plaques inserted in a circle around the, and contain lines from Lewis Carroll's poem "The Jabberwocky." A nice feature installed near major Central Park attractions are signs like the one above. If you dial the phone number, and enter the extension, a recording of a well known actor, or actress, will tell you information about the attraction. Actress Whoopi Goldberg climbed over Alice In Wonderland when she was a child, so she is the one to tell you all about the sculpture as this is her favorite. To see more views of beautiful Central Park please visit here and here. Since it is Halloween, I couldn't end this post without showing you my favorite little "trick or treater"! 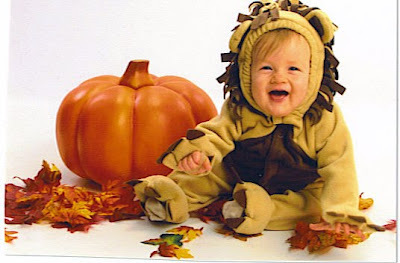 It's my grandson's first Halloween and he's a Lion, the King of the Jungle this year! I'm linking this post to Beverly of How Sweet The Sound "Pink Saturday" blog event. If you like the color pink please go to Beverly's blog today and see links for many other participating blogs that have pink posts today. Thanks Beverly! The White Horse Tavern, located at 567 Hudson Street and West 11th Street, in the Greenwich Village neighborhood of New York City, does not look too eerie, does it? It is, in fact, a pleasant place to stop and have a quick burger and a brew, but it is also well known as being haunted! Let's go inside, shall we? Inside the first room of the tavern there is a large, well stocked bar. There was lots of convivial conversation going on in this crowded room, although it was a little loud, as large screen TVs were blaring a football game. How could it be that such a raucous place could harbor a ghost? Even the little white horse memorabilia decorating all the nooks and crannies of the tavern looked so innocuous, almost cheerful. Now let's walk into the middle room. Ah! This is the spot the ghost haunts! Here is the favorite little corner table where the poet Dylan Thomas frequently sat during his visits to the tavern when he came to New York City. It was in this spot where, in 1953, he unfortunately drank himself into a stupor. He collapsed outside the tavern and was brought to the Chelsea Hotel, and later died on November 9, at St. Vincent's Hospital, at the young age of 39. There is a legend that his last words were: "I've just had eighteen straight whiskies, I think that's a record." His spirit is said to rotate this favorite corner table, as Thomas liked to do when he was alive. My husband and I sat at the corner table and offered a toast to Dylan, not with whiskey but with Guinness. Were those glowing orbs reflected on the table Dylan's ghost eyes smiling in approval? I'd like to think so! My post is part of Elizabeth of the The World Examining Works blog's first annual Halloween Party, and for more halloween themed blog posts join us at Theme Thursday. Central Park is a large public, urban park that occupies 843 acres in over a square mile in the heart of Manhattan in New York City. The park was designed by the writer Frederick Law Olmsted and the architect Calvert Vaux. It initially opened in 1859, was completed in 1873 and designated a National Historic Landmark in 1963. I visited with my husband on a beautiful autumn day this past weekend, and we decided to walk through the park, from the east side to the west, and entered The Children's Gate on East 76 Street, which is part of the area know as The Great Lawn. To see a map of the entire park, plus a downloadable PDF map please go to this website. As we walked down the path we were serenaded by the lovely tunes of an accordion player. The park is full of all kinds of musicians, and, if you'd like, you can see photos of many more that we met that day in the part one blog post I did a few days ago. The fall foliage was beginning to appear in New York City and some of Central Park's trees were ablaze with gold and russet color. At twenty-two acres the Lake is Central Park’s largest body of water, excluding the Reservoir. It offers a variety of activities for park, the most popular is row boating, and these vessels can be rented at the Loeb Boathouse at the northeast corner of the Lake. A gondola ride of the lake is also available. Bethesda Fountain and its sculpture,the "Angel of Waters," which was designed by Emma Stebbins in 1873. This is a very popular area, and one of the best people watching sections of the park. There were many visitors in the park this day, all enjoying the beautiful weather and gorgeous autumnal scenes. .....or pay to take a horse drawn carriage ride. On December 8th, 1980 John Lennon was shot dead as he arrived at his home at the Dakota Apartment Building at 72nd St. and Central Park West. A long time resident of New York City, Mr. Lennon had taken many enjoyable walks with his wife and young son through Central Park. In memoriam, on March 26, 1981, the city council adopted legislation that designated the area, stretching from 71st to 74th streets, as "Strawberry Fields." The name was taken from the title of a Beatle song called "Strawberry Fields Forever." The Imagine mosaic was a gift from Naples, Italy, in memory of John Lennon, and is located in the middle of the 2.5 acre of Strawberry Fields. "Imagine" is the title of a popular song written by John Lennon. Strawberry Fields opened on October 9, 1985, on John Lennon's 45th birthday. Every October 9th since then has seen an all day vigil of people of all ages from around the world near the Imagine mosaic. We walked out the West 72 Street park entrance and saw this happy newlywed couple walking into the park to have photos taken. This is The Dakota apartment building where John Lennon and Yoko Ono resided, located directly across the street from the 72 Street entrance to Central Park. Returning inside the park we saw more beautiful trees. The Sheep Meadow is a 15-acre, lush, green meadow for relaxing and admiring one of New York City's greatest skyline views. The sheep and a shepherd were housed in a fanciful Victorian building in what is now the Tavern on the Green restaurant, on the western perimeter of the Park, from 1864 until 1934, when the sheep were transferred to Prospect Park in Brooklyn. In the 1960s and the 1970s thousands of people were attracted to Sheep Meadow for large-scale concerts which unfortunately serverely eroded the lawn. This area was the first area in Central Park to be fully restored, and it reopened in 1981,now dedicated primarily to sunbathers and picnickers. A beautiful section of the tree lined mall is called "Literary Walk," and it displays many statues, including Robert Burns , as seen in the photo above, and Shakespeare seen in the photo below. The Dairy, built between 1869 and 1871, is one of Central Park's most picturesque structures. 19th-century children could enjoy a fresh, wholesome glass of milk at the Dairy. Today, the Dairy serves as a general visitor center with information on the history and design of Central Park, as well as current Park events and programs. It also serves as the official Central Park gift shop. To the west of the Dairy, on a large bedrock out crop called the Kinderberg or "children's mountain," stands the brick Chess & Checkers House. Today the 24 chess tables are located under a modern-day pergola outside. You can bring your own game pieces, or borrow them inside the building until 4:00 pm. Central Park's first carousel was built in 1870 and today's Friedsam Memorial Carousel is the fourth carousel to exist on this site. Built by the Brooklyn firm of Stein and Goldstein in 1908, the Carousel is one of the largest in the United States, with 58 hand-carved, painted horses. Over 250,00 children and adults ride it each year! A horse carriage traffic jam. Wollman Rink was built in 1949 when Kate Wollman donated $600,000 for it's construction. In the early 1990's, it was purchased and is now run by, Donald Trump and is now known as the Wollman/Trump Rink. Ice Skating is available late October through March. It is one of Central Park’s most popular attractions and more than 4,000 skaters use it daily. Central Park's new, state-of-the-art Zoo was built when the Wildlife Conservation Society took over the management in 1984. It showcases animals from tropical, temperate, and polar zones around the world. We were lucky enough to hear the Delacorte Musical Clock chime, and see the animals revolve to the music. It was enchanting! The elegant enterance gate to the Tisch Children's Zoo where children can get close to goats, sheep, a cow and a Vietnamese pot-bellied pig, plus the Enchanted Forest. The Abraham and Joseph Spector Playground, one of many children's playgrounds located in Central Park. I'll be showing photos of the most beloved sculpture in the park, "Alice In Wonderland" in my upcoming Saturday blog post, so please come back then to see that charming sculpture! Almost every park bench in Central Park has a dedication plaque on it in memory of someone, or to mark a special event, in part of the "Adopt A Bench" program. An example can be seen in the photo above. As we departed Central Park the same accordion player we saw hours earlier was still serenading the visitors with his beautiful music. It was a delightful end to another magnificent walk in the park! I am adding this post to Susan of A Southern Daydreamer blog as part of her weekly "Outdoor Wednesday" event. Please visit Susan's blog today to see links more blog participating. Thank you, Susan! The Pink Brooklyn Brownstone is For Sale! Pink Saturday Hair...and a Thank You!